A tech firm is consolidating its headquarters to a single space in downtown Charlottesville less than a year after the company announced plans to expand its operations in Albemarle County. CoConstruct LLC, a software provider, has leased 40,000 square feet of office space at the 3TWENTY3 building at 323 2nd Street SE in downtown Charlottesville. 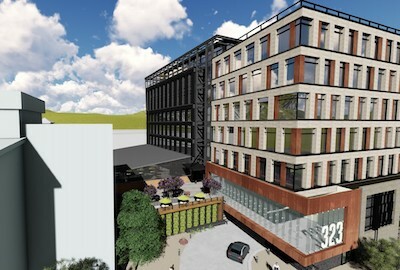 Plans call for the tech firm to move in when construction at 3TWENTY3 is slated to finish in spring 2020. In May, CoCounstruct announced plans to expand its operations to Albemarle and create 69 jobs. The Virginia Economic Development Partnership planned to help CoConstruct through the Virginia Jobs Investment Program. Under the program, CoConstruct was eligible for $1,000 per job for up to a total of $69,000. Albemarle Economic Development Director Roger Johnson told the Daily Progress on Friday his office planned to work with the city to support the company's plans. 3TWENTY3 will be a 120,000-square-foot, five-story office building with a four-story, 200 space parking structure. The building has around 50,000 square feet of office space still to be leased, says John Pritzlaff, the Cushman & Wakefield | Thalhimer senior vice president who represents the property. CoCounstruct plans to consolidate its two current offices in the Charlottesville area into the new location. Its current offices are at 375 Greenbrier Drive and 1807 Seminole Trail outside of downtown. The company will occupy space on the first and second floors at 3TWENTY3, both of which are elevated. CoConstruct is the second tenant to be announced for 3TWENTY3. The company could not be reached for comment on its plans. “CoConstruct needed a location that allowed us room to grow and that reflected our style to employees, recruits, and clients,” Donny Wyatt, CoConstruct founder and CEO, said in a press release. The law firm McGuireWoods has leased 17,218 square feet on the third floor of the building. 3TWENTY3 is being developed by Insite Properties, a Charlotte, N.C.-based commercial real estate firm with an office in Charlottesville. Atlanta-based Batson-Cook Construction broke ground on the project in November. The architect is Charlotte, N.C.-based BB+M Architecture. Jay Kessler is the project manager and represents the ownership group for the project. Amenities planned for 3TWENTY3 include a pedestrian plaza and walkway, common lobby space, rooftop event space, catering kitchen and patio, electric car charging stations and bike racks. The office market in Charlottesville has seen below-average vacancy rates with limited supply. The city’s office vacancy rate was 1.7 percent in August, according to a study commissioned by Charlottesville’s Office of Economic Development and its Economic Development Authority.